My mom bought a kilo of chopped pork ribs this morning without knowing what to do with it. She loves doing that. Good thing for me, I have something to cook without spending a penny. Just like what I’ve said she does not have any plan about it. Evidence? She does not bought any ingredients to go with it. With no ingredients or vegetables on hand, I quickly thought of a dish that does not require any vegetables or whatsoever. Then, I thought of braised pork ribs. I checked my herbs and spices and found some ingredients that would perfectly go with this pork ribs. I cleaned the pork ribs and trim it a little. I arranged the chopped ribs in a pressure cooker. Chopped some garlic and onion and threw it in the pressure cooker. I took some teaspoons of powdered cumin, cloves and oregano. Pour a cup of red wine, soda and water. Seasoned it with salt and pepper and pressure cook it for an hour and a half and voila! 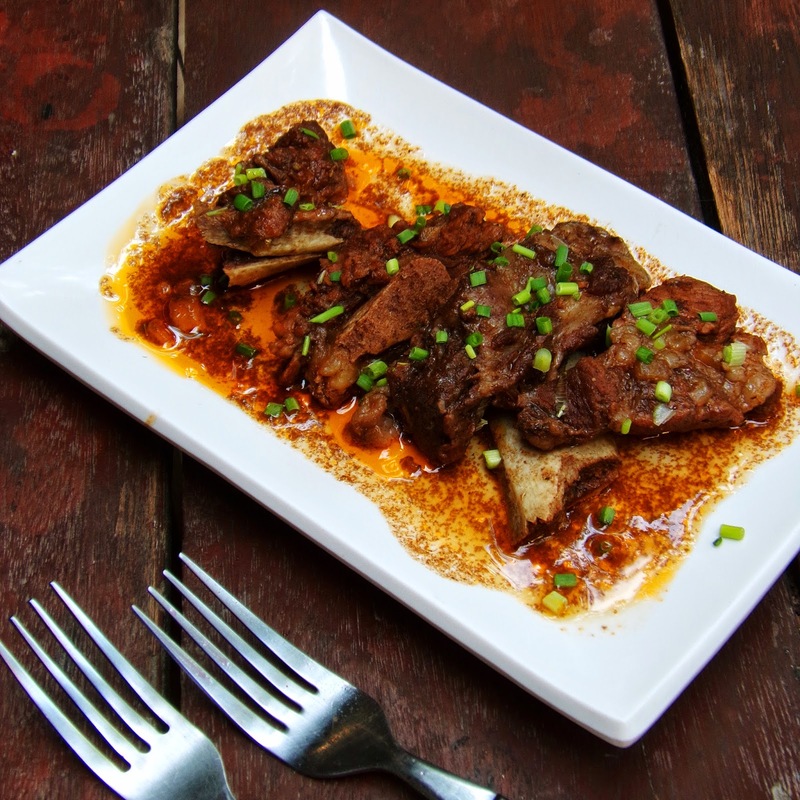 This braised pork ribs is best enjoy with hot steaming rice and fresh tomato salsa. Chopped parsley or onion spring to garnish. Clean the ribs. Remove the rubbery film of the ribs. Place the ribs in a pressure cooker. throw the garlic, onion, cumin, clove and oregano in the pressure cooker. Pour in the tomato sauce, red wine and cola and season with salt and pepper. Pressure cook for 1 1/2 hours. By this time, there would still be plenty of water so simply remove the lid and continue to simmer until the sauce thickens. Taste and season with salt. You can garnish it with chopped parsley or onion spring. This would perfectly go with a nice cold fresh tomato salsa. Simply chopped some tomatoes and onion and season with salt and some dried oregano. You can also use fresh chopped parsley instead of dried oregano. Add some dried chili flakes to give it a kick.